As the weather gets cooler and kids are spending more time inside, busy moms need fun activities to keep the little ones occupied. Here are 12 easy and adorable fall crafts that are great for various ages of toddlers and kids. 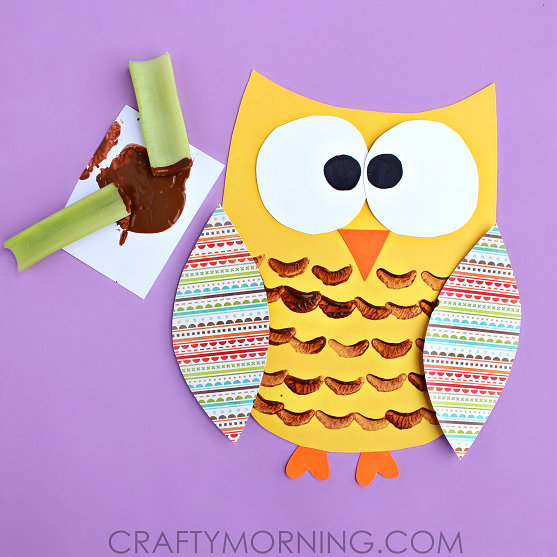 This celery stamped owl craft from Crafty Morning uses simple supplies to make quite an adorable little owl. Take a fall walk with a “mission”, collect acorns! After painting them they can make a beautiful centerpiece. Instructions can be found here on Home Stories A to Z ‘s blog post. I just love these glow stick brooms by One Little Project. I can picture handing them out at trick or treat (we support FARE’s Teal Pumpkin Project and hand out non-food treats so any kids with food allergies can also have a safe & happy Halloween). My older kids will be able to help me make these adorable brooms. Kids of all ages can use their strengths to decorate a paper with paint, yarn, washi tape or glitter. The Best Ideas for Kids gives great tips and ideas on making these simple leaf silhouettes. I hope to use these as the fronts to “thank you” cards that my kids will write to our extended family for our Thanksgiving dinner. The perfect fall accessory for a fireplace mantle, window frame or shelf. With a plastic needle and larger holes, even the toddlers can work on their fine motor skills by stitching yard through the felt leaves. More information and display ideas on A Beautiful Mess. These simple acorns are created by Still Playing School by cutting and painting repurposed egg cartons. I love the gentle reminder (for kids and adults) that you can find art in everyday things. 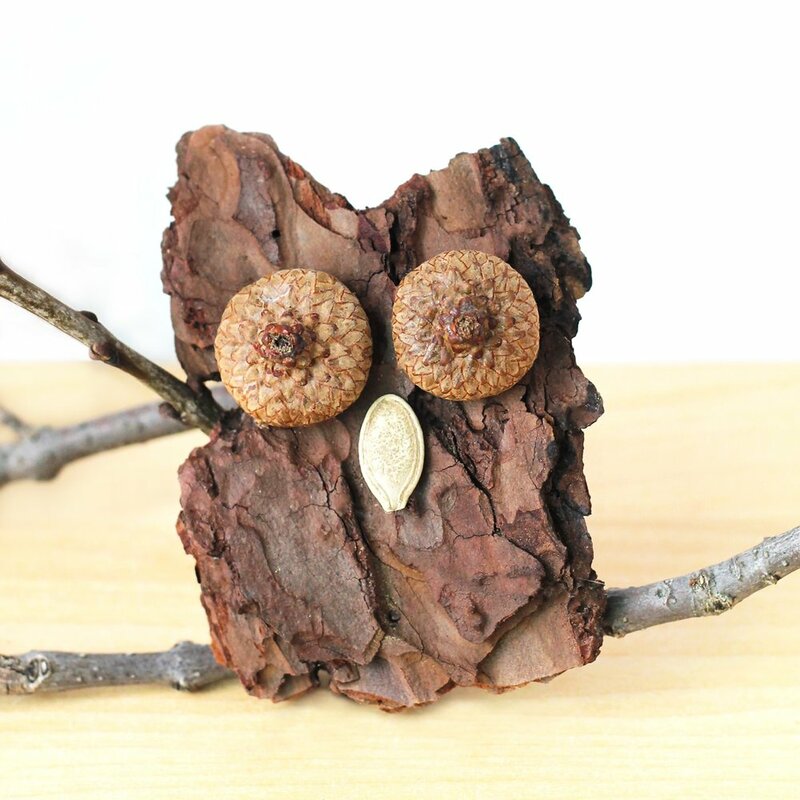 Fireflies and Mudpies created this adorable owl by breaking pieces off a chunk of bark that was found during a hike in the woods. A perfect excuse to buy more washi tape (or maybe use some of what is already in the stash…). I Heart Crafty Things put together this sweet craft that is good for all ages. Easy toddler craft! 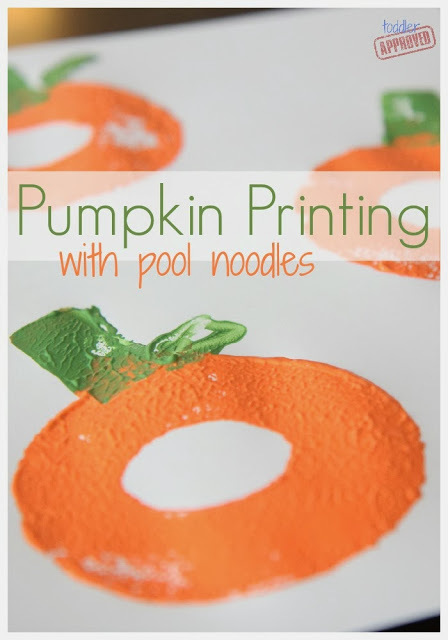 Toddler Approved has put together a great set of directions on using pool noodles to create these cute pumpkin prints. Work on fine motor skills with your younger kids, Paper and Glue gives some great ideas on shapes and colors to wrap with yarn. And after they wrap the leaves, they can use scissors (supervised of course) to snip the extra yarn and make these cute trees. The free tree printable is available on 3 Dinosaurs. Grab some of your favorite Duplo Lego pieces and follow Crafty Morning’s easy directions to make these great fall decorations. Leave a comment below to let me know which of these crafts you have tried this fall.